1. 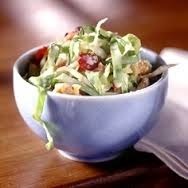 Mix cabbage, dried fruit and carrots in a large bowl. 2. In small bowl, mix vinegar, sugar, oil, salt and pepper. 3. Pour vinegar mixture over cabbage mixture.